A new generation of Super Smash Bros is finally here. The 3DS version of Smash Bros released in October and while it was a nice appetizer, everyone expects more of the Wii U version. With six years worth of waiting since 2008’s Brawl put into Super Smash Bros for Wii U, does the game live up to the hype and deliver on the promise of an HD Smash Bros? Let me start with something that I believe most 3DS players will understand. Booting up Smash Bros for Wii U after playing the 3DS version extensively since October takes away a lot of the initial “wow” factor. The visuals immediately make your jaw drop, the music gets you humming along and the fan-service for each character unlock is well done. That said, most Smash Bros fans knew about all the surprises going into the Wii U version. There are exclusive stages and modes which help to make the Wii U version feel special but overall the 3DS release takes something away from the console version. Its like watching a fantastic movie for the first time with the film’s surprises already spoiled for you. The 3DS version was a nice warm up but the Wii U version is the real main event, the Ali vs Frazier, Stone Cold vs The Rock of this situation. Smash Bros for Wii U feels like a mix of Brawl and Melee, in all the best ways. Fighting feels tighter and character attacks feel more thought out than ever. The new additions to the franchise stand out as some of the best since Melee’s overhauled roster in 2001. The Wii Fit Trainer, Little Mac, Pac-Man, Villager, Mega Man and others are solid contributions which add new layers to combat. Each are well balanced with interesting strengths and weaknesses. Little Mac, for example, is very quick and can deal a great bit of damage quickly but isn’t great in the air. Smash Bros does feel like it’s missing that “oh my god” character, like the shock of seeing Sonic in Brawl in 2007 or Solid Snake. I don’t know major it would be but the inclusion of Rayman as a trophy in the game but not as a playable fighter is off-putting as he’d make for a tremendous addition to the roster. The Mii Fighter can be customized with various equipment and be based on different classes. Do you want to be a slow but powerful brawler like Ganondorf or a speedy swordsmen like the Fire Emblem characters? The choice is yours and the game does a good job of rewarding you with new equipment for your Mii as you play. Visually, Smash Bros is stunning on the Wii U. Everything runs smoothly at 60 frames per second. With so many games releasing this year with flaws, bugs and technical issues galore its refreshing to play a game that works as advertised and even better than you’d expect. The whole game runs beautifully at 1080p, standing above most of Nintendo’s 720p first party affairs. It feels like you’re fighting in a superbly animated Disney film, never wavering or flinching despite the chaos on screen. Online play is significantly improved over Brawl’s. After a few hours of online matches, both For Fun with anyone, For Glory with anyone and with friends I have experienced very little lag. There will be random instances of lag throughout your online battles but for the most part you’ll never have to deal with it. 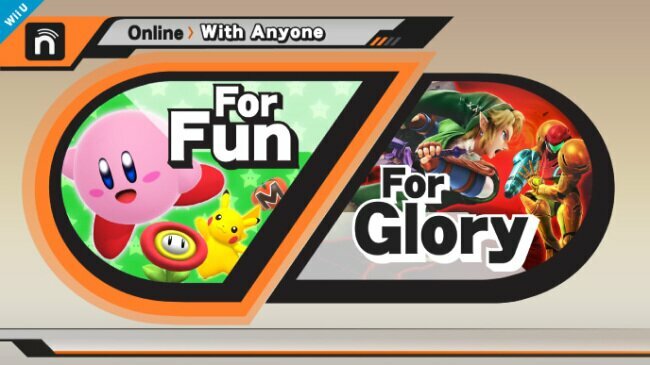 This is a welcome change after Smash Bros Brawl was plagued with online issues when it launched in 2008. Nintendo getting a helping hand from Namco for development likely played a role in this. Again, to play a highly anticipated multiplayer game online with no issues on day one in 2014 is relieving. Where GTA Online, Destiny and Halo MCC stumbled with online issues, Smash Bros for Wii U works like someone who spent $60 on it would expect it to. Players can play various 2-player co-op modes like in Stadium and now Smash battles can support up to eight players. These eight player battles take place on the largest stages and can be very hectic. It can be very hard to keep track of all the action with six, seven or eight players on screen so this isn’t the mode to play to prove your Smash supremacy. Eight players can be hilarious fun though especially at parties. Just know what you’re getting yourself into before opting out of Smash’s traditional 4-player battles. Smash Tour is a Mario Party-like mode where four players battle it out on a game board. Players move across the board like you would in Mario Party, collecting stat boosts like in the 3DS’s Smash Run mode. Every time players collide with each other on the board a battle with all players ensues. Once all turns have been used, players duke it out with all stat boosts they acquired. This mode should be more fun but falls flat. Some will absolutely love it but I just couldn’t enjoy it after several attempts with three other people. No one in my playtime with Smash Tour disagreed with my disinterest in the mode either. Its hard to not applaud Sakurai and company for the level of detail and depth in this package. The soundtrack is filled with hits from a wide range of franchises. Criminally, there is no Gusty Garden Galaxy theme for the Super Mario Galaxy stage though that can be forgiven easily due to the wealth of amazing tracks overall. The fan service and depth doesn’t end there. Trophies, character videos, classic game demos and the stage creator all flesh out an already near perfect package. There is so much to push through here that fans will be wrapped up in Smash Bros for months. Super Smash Bros for Wii U is like no other game released this year. It delivers on all of its promises, somehow achieving the difficult task of justifying a six year wait between installments. So many major releases have had more money put into them and been significantly more flawed out of the gate. Super Smash Bros is a treat to play alone or with friends, an oasis among a desert of over-hyped AAA releases. This is the best entry in the series and worth the price of a Wii U on its own. Super Smash Bros for Wii U is the real main event of Smash Bros this year. The game runs beautifully at all times with stunning HD visuals. 8-player battles, new characters, fantastic online play and help the game live up to the hype and surpass it.